With the bus fare from only AED 25 one way, you shouldn’t need any more excuses to skip brunch next Friday to go and check it out. But in case you still need a little more persuading, here are my top five things to do in Al Ain. A surprisingly nice zoo, with over 3500 animals from 179 different species, from hyenas to hippos, gazelle to gibbons, meerkats to monkeys, it’s an impressive array. 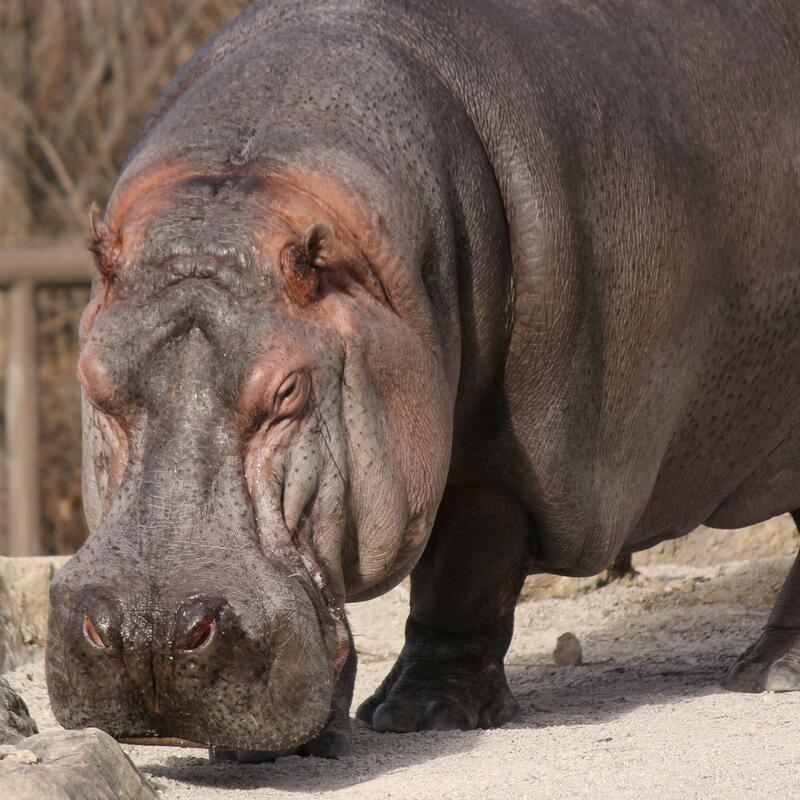 The environment for the animals seems comparable to any other world-class zoo and it’s well planned layout gives it an open and comfortable feeling for visitors, with lots of grassed spaces for picnicking. There’s a little noddy train that can take you around if its too hot to linger, but a tip for the summer months, in May to Oct the zoo opens later, from 4- 10pm (and it is closed entirely throughout Ramadan). On our latest trip, we went after sunset, thinking the park would be well lit. Presumably for the animals’ comfort, a lot of the enclosures weren’t. I would recommend heading there before nightfall for the best experience. Coming soon to the zoo are two new additions, the Sheikh Zayed Desert Learning Centre and also, the world’s biggest man made Safari – which we’ll certainly be returning to explore when it’s finally open. Find out more about times and prices on the Al Ain Zoo website. As you probably guessed, the oasis is not much more than a dense thicket of trees. 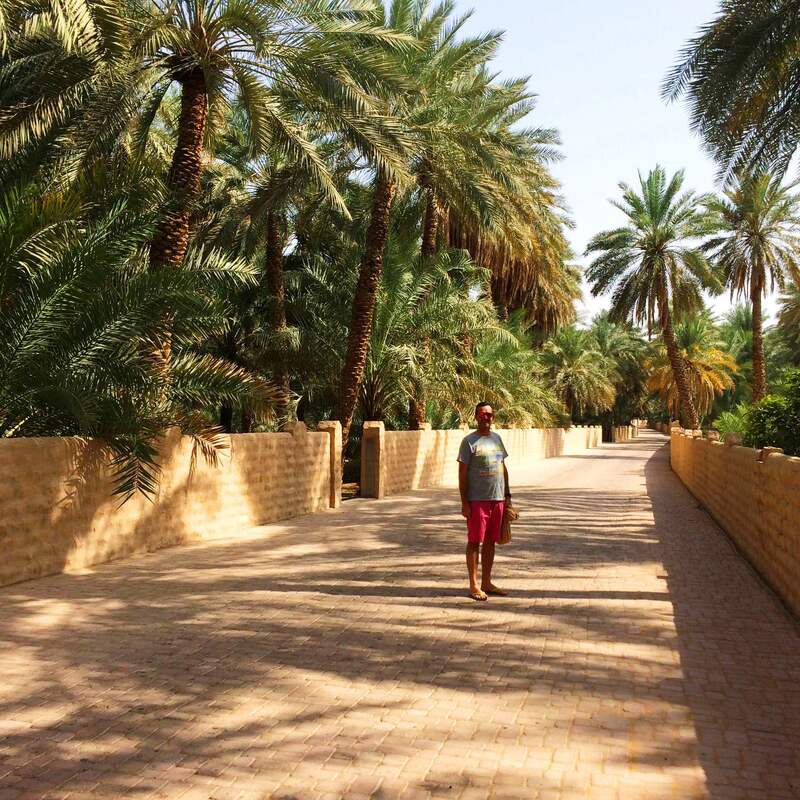 But for a resident of the UAE, a stroll around this vast forest of palm and fruit baring trees is an awe inspiring sight. This place is big; over 3000 acres containing over 147,000 trees. We got lost in the winding paved walkways, but every direction you look down every turn is green and beautiful. It makes for an unusual stroll in what is essentially a desert landscape, and is incredibly peaceful too. Take water with you. Entry is free. See more pictures on the VisitAbuDhabi website. I only got to visit the fort on my second trip to Al Ain. I previously attempted to go on a Friday when the opening hours are short, from 3pm to 5pm – blink and you will miss it. On other days the hours of opening are much more generous. Built in 1891, it was originally the former headquarters of the Oman Trucial Scouts, the force that protected the mountain passes and kept inter-tribal peace. Now it serves as an worthy tourist attraction, which also contains an exhibition about English explorer Wilfred Thesiger and his 1940s crossings of the Rub Al Khali (The Empty Quarter) desert which was pretty interesting. 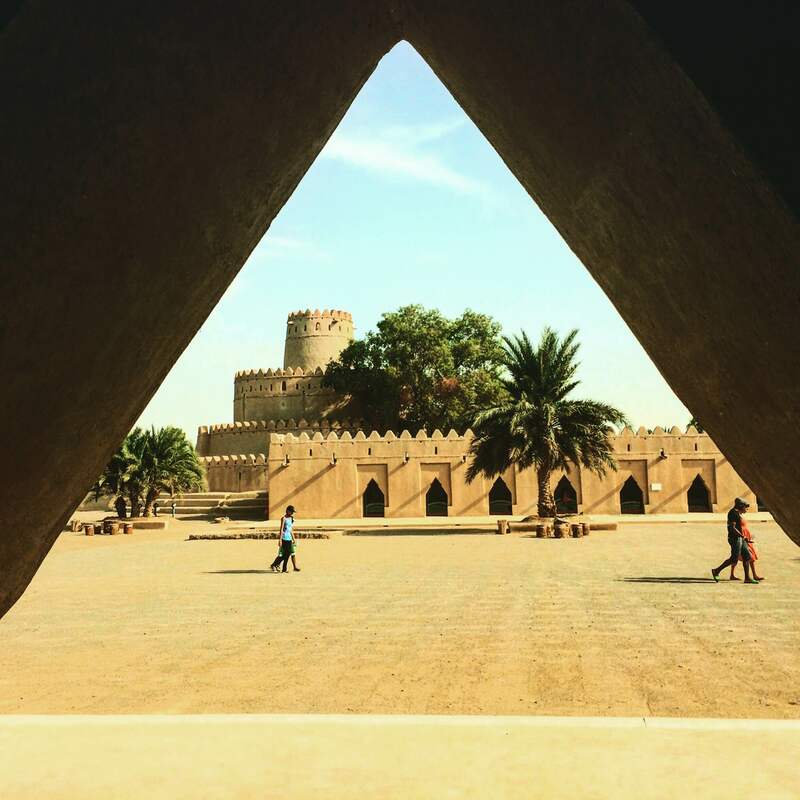 Find out more about the fort and it’s opening hours on the AbuDhabi.ae website. A great day trip activity. Wadi Adventure is a super cool facility, with river kayaking, rafting and even an inland wave where you can learn to surf. It’s a unique to experience to try these white water activities in the middle of a desert environment, under the backdrop of the dry, red earth of the mountainous Al Ain terrain. We tried the white water rafting with friends, and it was a lot of fun. I heard a rumour that the river flow and rapids are based on the river Treweryn, in Wales. I once paddled its natural counterpart with my university kayaking club, and I can tell you that whilst the Al Ain version is still thrilling, it’s comforting to know there will be no surprise underwater obstacles if you do happen to fall out. You also get to do a few practise runs on the smaller, slower rapids before progressing to the main one, and every corner is manned. They also have the ability to stop the flow of water should you get in a tricky spot. If you’ve been reluctant to try rafting in the past, this could be a great introduction to the sport. But be warned, your paddling muscles are sure to be aching the next day. 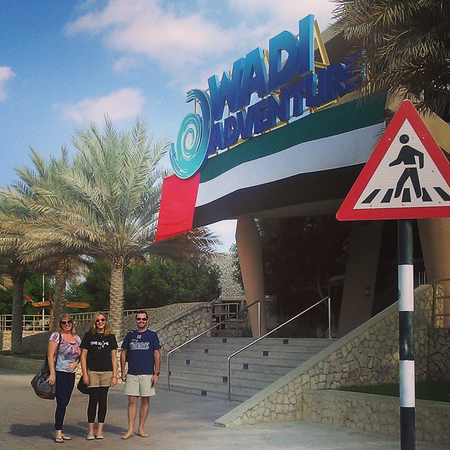 Explore the different packages on offer on the Wadi Adventure Website. the Al Ain skyline. Standing alone, straddling the Omani border, it does seem much higher than its 1,249 metres. It’s a popular tourist attraction as you can simply drive up the 11.7 kilometre winding road to benefit from an magnificent view of Al Ain city. What I didn’t realise when we went, is that the interest isn’t only at the top. There is also an extensive natural cave system that worms through the mountain and also hot-water springs that lies within the foothills, that trickle down and eventually form a lake that are popular for swimming. 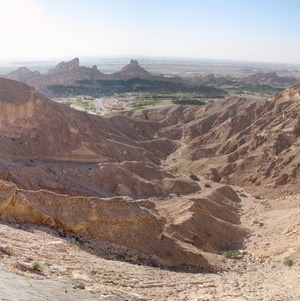 Read more about Jebel Hafeet on the Explore Al Ain website. At only 120kms from Dubai, and 140kms from Abu Dhabi, Al Ain makes a great weekend escape from the big cities. As a day trip, you are sure to find plenty to do and see to make the journey worth your while. If you are planning a weekend break, there are some nice hotels where you can kick back and enjoy the more relaxed pace of life. 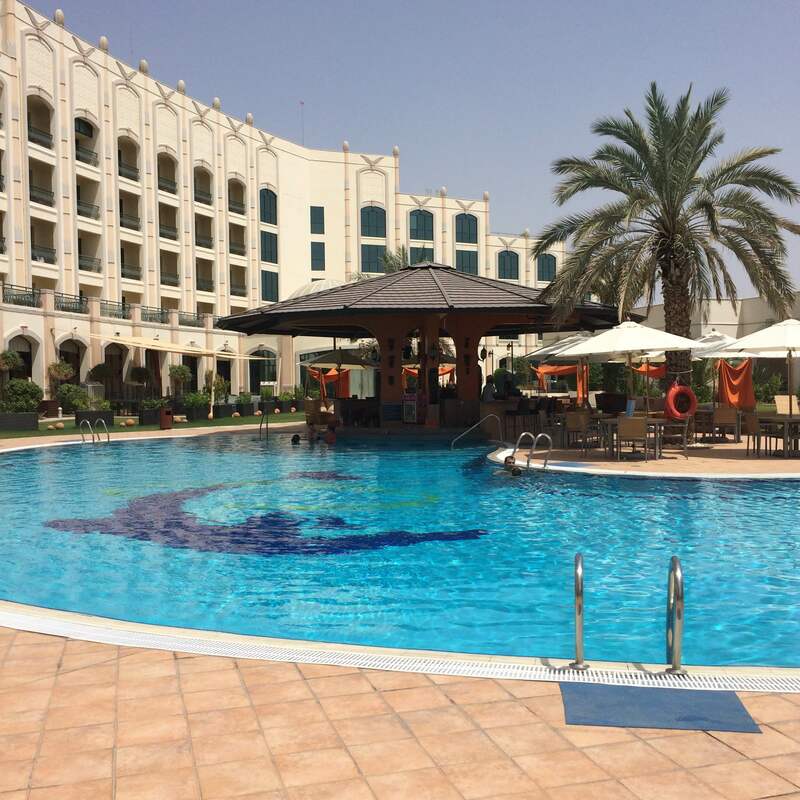 We stayed at Al Ain Rotana, which has a lovely swim up pool and is central to most of the tourist activities. It’s also home to Trader Vics, a social hub for the Al Ain expat community. There are no high rise buildings to make you feel enclosed, and the whole city is green and well maintained. Would be great to hear your favourite spots in Al Ain. Please share your ideas for more things to do in the comments below, and we will aim to check them out next time we go. Also, there is the Al Ain Raceway for go-kart enthusiasts.